The well-known international poker forum, 2+2 demonstrates its comic humour again, this time chucking its focus on Full Tilt Poker. As most of you might already be aware, Full Tilt Poker is being investigated by the FBI for supposedly accepting players from states (i.e. Washington) where online poker is already banned, breaking the legislation of the UIGEA, to be placed in full effect in June. Although I don’t think that the people leading Full Tilt Poker (like Howard Lederer and Phil Ivey) will spend the rest of their time behind bars, the Photoshop section of the 2+2 forum seem to have pondered on this idea, not afraid to push it that extra step. Thousands of people play poker on a daily basis and the possibility of making easy money attracts more and more new players. It’s inevitable that a great player pops up from time to time to make a career out of poker. Many players have Lady Luck on their side, winning huge amounts in minimal time and others remain on a gradual decline from day 1. As a poker guru, I have also experienced the highs and lows of playing poker. Here, I have collected a few of my favorite and memorable player searches. The colorful variety of different players can be visually viewed in the graphs below. 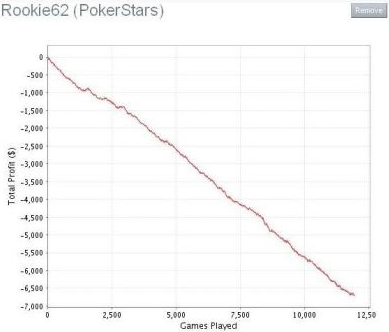 Is it possible that someone plays 12,000 micro-limit Sit’n’Gos and learns nothing about poker during the process? I think this question is best answered by Rookie62. The poker extraordinaire tossed his bankroll underwater by playing $2 Sit’n’Gos. Most of the time, he plays 2-4 tables and if he is patient enough, he could become the biggest loser in the world. His talent is given. Here I have collected some of the best pictures on the net with their theme being related to poker. Enjoy! Funny Poker Video Ads - Sure to tickle the funny bone! Here I found a collection of some of my favorite funny poker-related videos and ads. Check them out and enjoy! To begin with, let’s start with a Full Tilt Poker classic, starring Phil Ivey. A surprise awaits Phil when he gets home. Full Tilt made several similar ads based around the theme ‘One of the best poker faces in the world’.